Quick and Easy » Greek Penne Rigate-Not all Pasta is Italian! 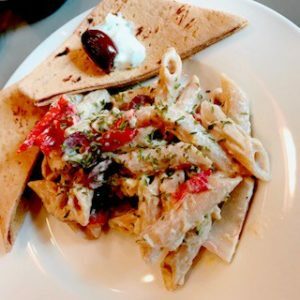 Greek Penne Rigate-Not all Pasta is Italian! Greek Penne Pasta is the perfect dish when it’s too hot to cook! The Greek sauce is what really makes this dish, along with the roasted red peppers, pepperocini and black olives. Who says pasta has to be Italian? This Greek Penne Pasta is really good when it’s just too hot to cook and/or eat a heavy meal. You probably already have most of the ingredients in your pantry! The Greek yogurt sauce with fresh dill and cucumber is what makes this dish really stand out! You can use any pasta for this dish, but I’ve found tubular pastas-penne, rigatoni, macaroni or rigate-works best because the tubular pastas allow the sauce to hide in each pasta tube, making each bite more creamy than the one before. Do I Have to Use Greek Yogurt? No, you can use a traditional yogurt, but Greek yogurt is thicker than French or American yogurts. The thick, creamy sauce is key to this dish. According to the The National Yogurt Association, it is best to look for a “Live and Active Cultures” seal on yogurt packaging, to ensure you’re not getting one that is partially GMO or high in sugar. What Can I Serve with Greek Penne Pasta? 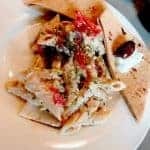 Since there’s already an element of dill and cucumber in the sauce, I recommend a light cucumber and red onion salad and perhaps some kalamata olives, dolmas or pita bread. This would also go great with Mediterranean Lamb Loins. Who says all pasta has to be Italian? This creamy, tangy Greek sauce will have you saying, "OPA" in no time! The Greek sauce, Tzatziki, can be served as a dip as well. Serve it chilled with pita bread or vegetables.